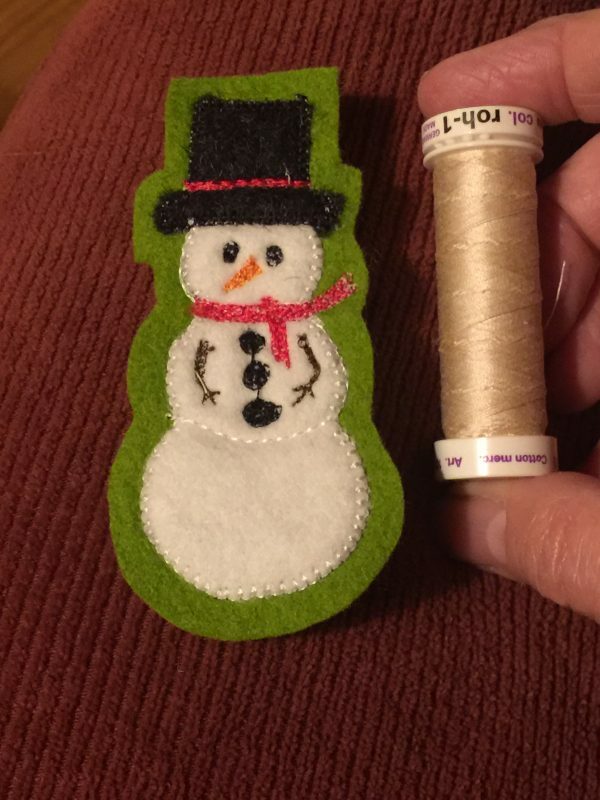 Ashley’s snowman, sewn on my trusty Janome 9400, using the buttonhole stitch and free motion stitching. Do ya ever have those moments when you walk into your studio / crafting space / hides hole and have a near panic attack because there are so many mid-stream projects that serious ADHD kicks in and you can’t do anything because you keep getting distracted by yet another something? Yeah. It was one of those days. I’ve added enough books and class materials (classes I’ve taken) that my shelves are too full. So I had to find a box and remove 15+ years of Threads magazines that I never look at to clear space because I’m tired of moving the piles from place to place. And a bunch more tidying happened. Really…it was like a minor panic attack. But Ashley and Joshua are visiting. And a while back Ashley mentioned that she liked the Apple Pin I gave her, seen here, so much she’d like to do a bunch for each season and holiday. 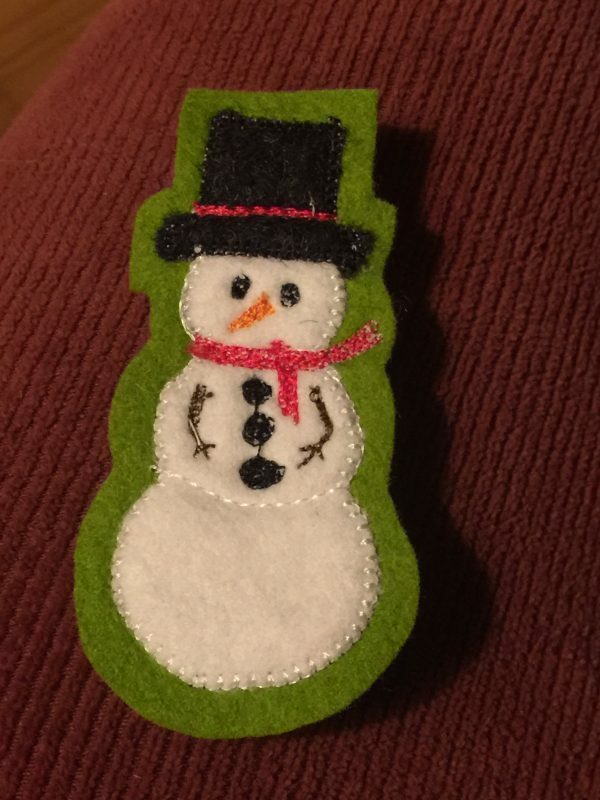 So I found my felt and the pin backs and made this little guy in under an hour. He’d look adorable done with real hand stitchers! I also need to find decent quality pi backs. These are by Beadalon from my local quilt and fabric shop and they are junk! Last photo is for scale. Spool of thread shown to indicate size. Pink back is under hat brim. Need to find much better quality pin backs! The last bits of fleece make an easy peasy hat! So I decided to use up the very last bits of my buffalo check fleece. I began with 4 3/4 yards of the 58-60″ wide cloth. The second photo shows the last bits! These hats are SO FAST to make…including figuring out the best sewing sequence it took less than an hour for the first one. If you wanted to make a half dozen, you could do that in an afternoon–quick and easy winter gifts! This is all that is left of 4.75 YARDS of fabric….that is 10,260 square inches. Under 200 left! I even made some tassles/trim out of the selvages! This hat will be a free pattern soon–not sure yet if it will be here or at Shannon’s site, but you can make one of these in well under an hour from scraps. Truly, I used maybe 10×25 for the white part, 5 x 25 for the bottom, and a bit more for the tassles/dangly bits. 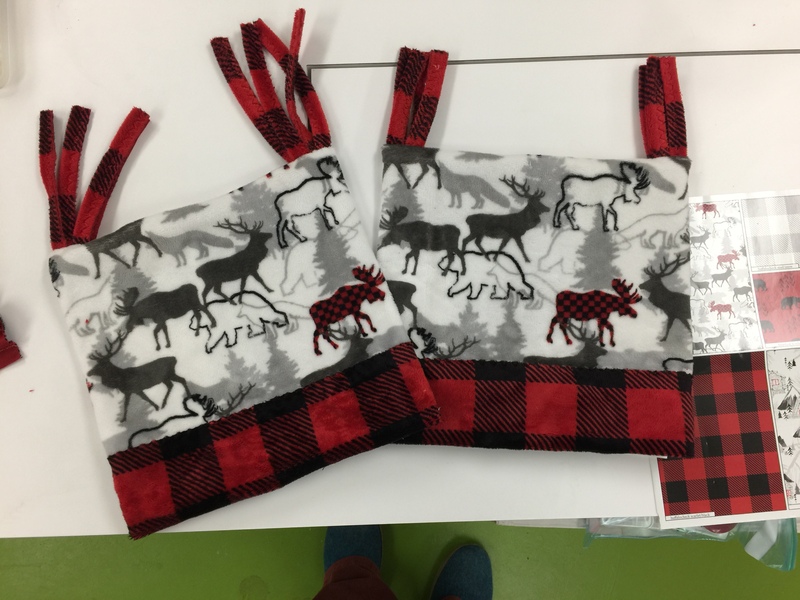 I just sewed two tubes to fit my head, one of the white print, one of the buffalo plaid. The white print is here at Fabric.com. Because the fleece is thick, and because I wanted the soft part next to my forehead, I didn’t use a typical garment seam. Instead, I overlapped the two fabrics, wrong sides together, and sewed them with a serpentine stitch. I did this twice, on either side, so I would catch both edges of the overlap. My finger is pulling the two pieces apart so you can see the overlap. 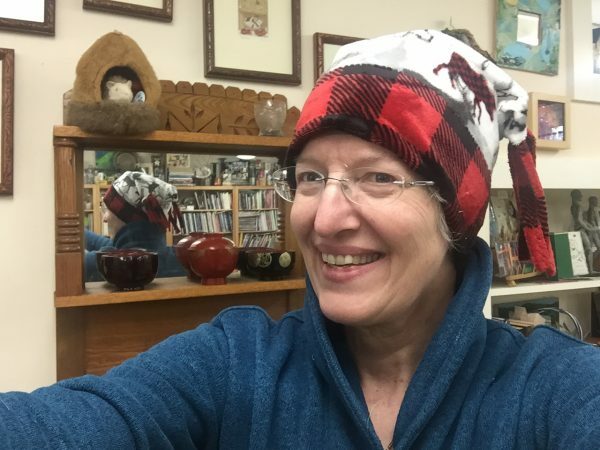 I then turned the plaid to the outside and brought it up above the seam that joins the top of the hat to the “cuff.” I pinned the fabric at both edges so that I kept the amount of black that shows at the bottom even all the way around. As I mentioned in my earlier posts about the throw and the jacket, the inside of Cuddle is slippery, so pin well. Because the fabric does not ravel, I didn’t need to turn under the upper edge of the plaid cuff. I used the serpentine stitch to it down. Finally, I made some dangly bits using the trimmed off selvages (they were about 1″ wide plus lengthwise grain of course): fold in half wrong sides together and use serpentine stitch. Cut to length, insert two, each folded in half, at either end of the seam at the top of the hat, and sew the final seam. Because of the bulk from the dangly bits, I found it far easier to sew from the center to the ends, lock off the stitch and repeat for the other side. Two hats…I mean I used up EVERY LAST BIT of scraps! One hat for me, one to send to Shannon for them to use as they wish! Talk about a quick and easy Christmas gift! 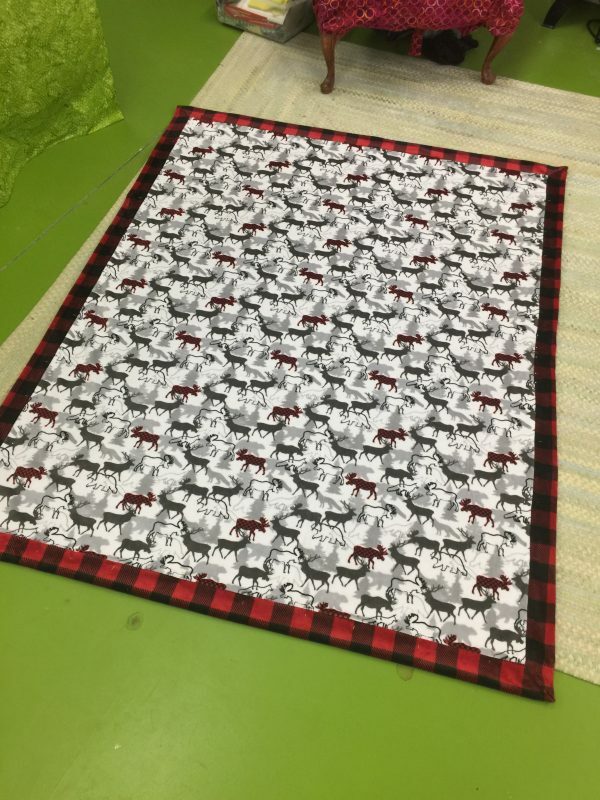 THANK YOU Shannon Fabrics for this wonderful fabric and an October full of fun, fast and easy fleece projects. I look forward to making more…I’ve got some Christmas gifts already made which I can’t share due to friends looking at my blog, and another big length of fleece to use on a snuggle quilt for winter! 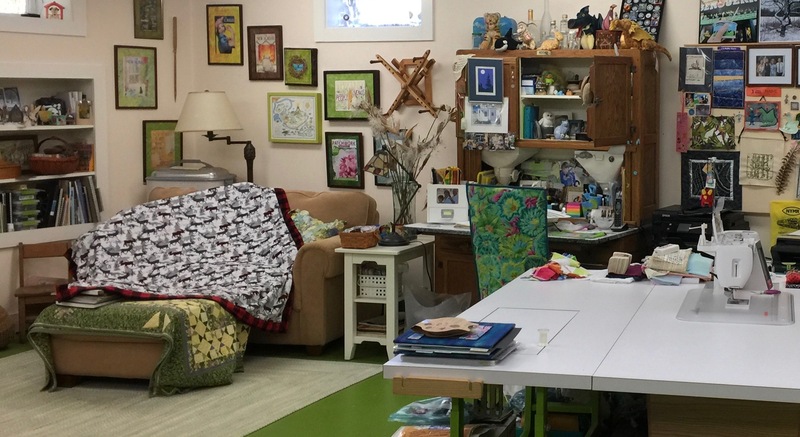 Hi everyone…preparations for teaching at International Quilt Festival Houston are nearly done, so I can return to somewhat regularly sporadic blogging! 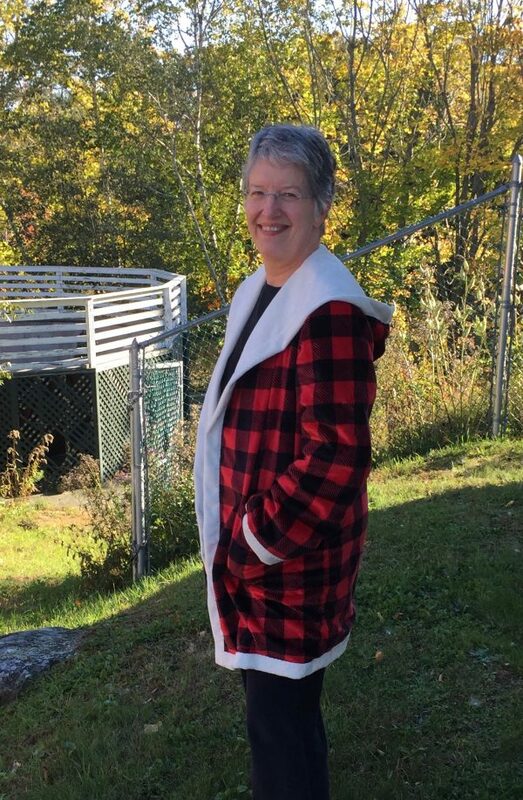 In addition to that snuggly lap robe/blanket in Cuddle fabric, I also recently made a hooded jacket using two layers of fleece and a Simplicity pattern. 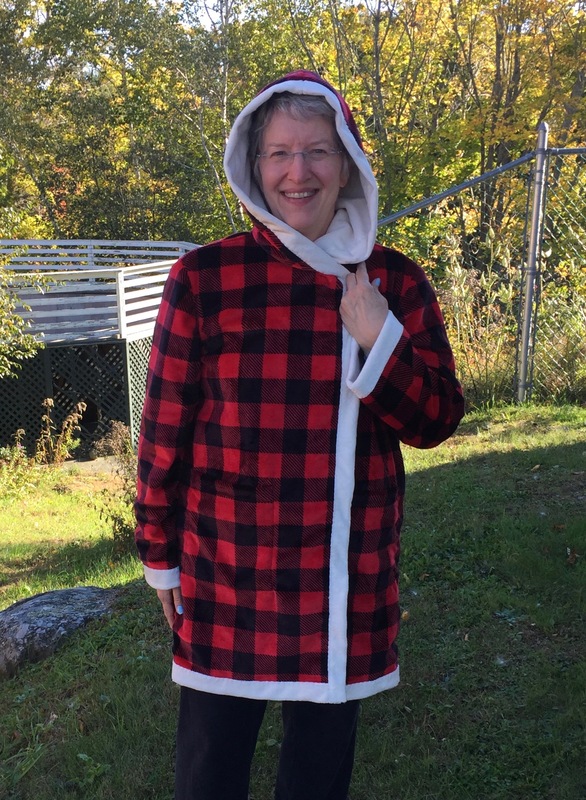 Cuddle-y two-layer fleece jacket–I may not want to take this off this winter! 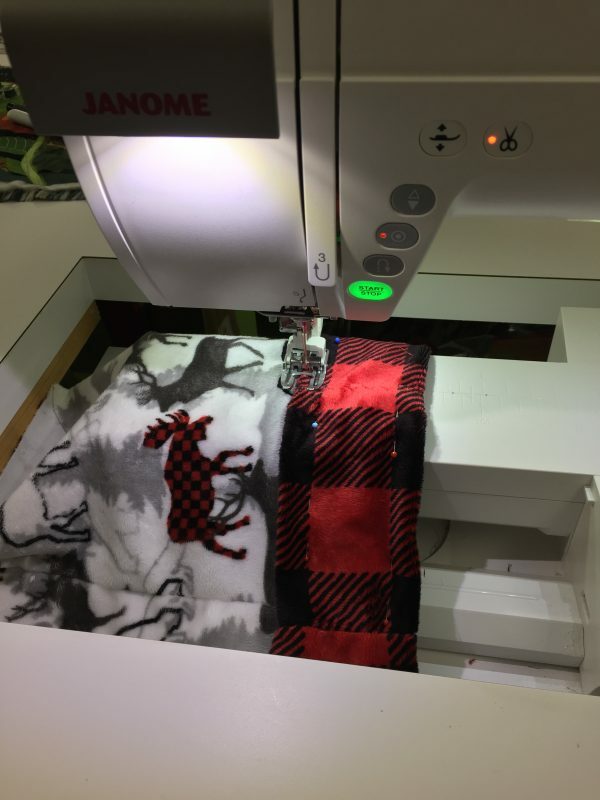 As I’ve; mentioned in earlier posts, I totally fell in love with Shannon Cuddle fabric at the Janome Education Summit this past May. 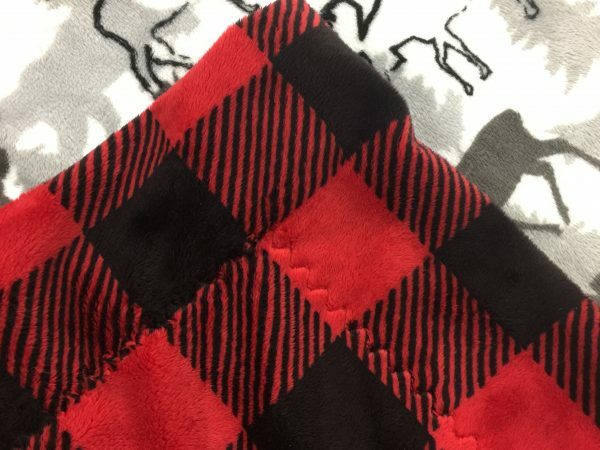 Here’s a link to the buffalo check (temporarily out of stock as of October 30) Shannon scarlet and black Cuddle. Here’s the pattern I used, Simplicity D0761. 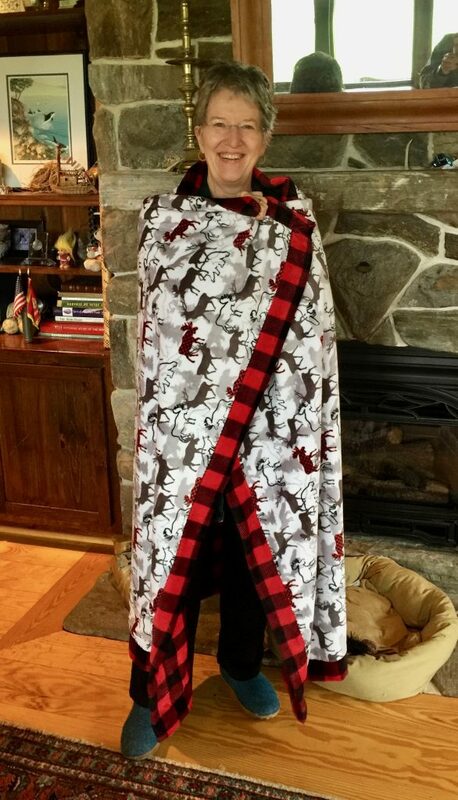 I purchased 2 3/4 yards of both the ivory cuddle and the buffalo check. I would recommend an extra quarter yard of the check if you plan to match the plaid as I did at sides and sleeves. The pattern is cool because the hood is cut with the fronts as one big piece. The only fiddly part in the entire thing was the shoulder-back neck-shoulder seam, and even that worked a charm with careful pinning. A confident beginner could probably tackle this. The pattern is designed for a two-sided fleece such as the sherpa/suede. Instead, I made two jackets. I cut the outer jacket perhaps 1/8″ larger than the pattern and sewed it with a 1/2″ seam allowance, not the standard 5/8″. 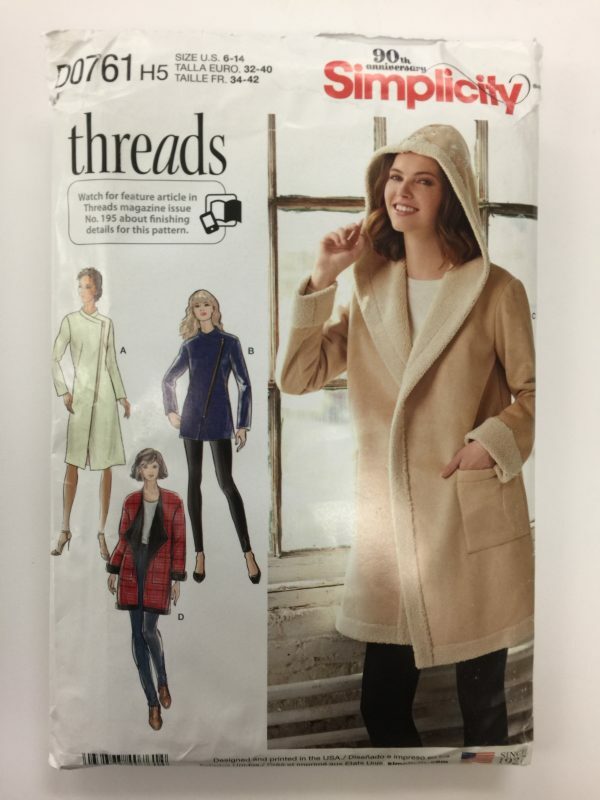 I sewed the ivory inner jacket at accurate size and with a generous 5/8″ seam allowance. This allowed the fluffy Cuddle to fit inside. HOWEVER, the back side of the Cuddle is slippery. If I were to make this again, I think I would cut my fabric pieces slightly oversized, sew them together as if quilting (wrong sides together) along the black stripe, THEN trim to final size and sew it as if it were ONE fabric. Currently, even though I tacked the coat at the neckline, it has a propensity to wiggle and sometimes bubble at the hem. The pattern doesn’t have a closure, but I have some black toggles on faux-leather and may use one. And a side view showing the hood. 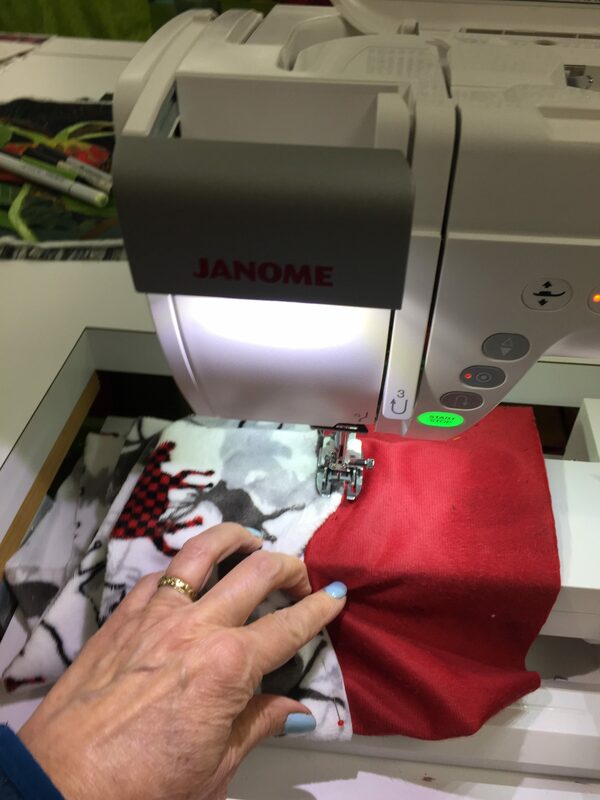 Thanks as always to Janome America…sewing this on my Janome 9400 was a DREAM. I used the acufeed foot for pretty much everything and the serpentine or lightning stitches. I used the lightning (a type of zigzag) for seams at 10 width and 3.0 length, which accommodates any stretching. I used the serpentine on all the turned-over white bits. Since the Cuddle does NOT RAVEL at ALL, you don’t need to turn under the edges so the serpentine was perfect and it hides in the pile of the fabric. I’ll repeat the tip I gave before on the blanket: minky type fabrics are known for shedding fluff. To minimize the mess, cut from the back side (with a scalpel type cutter if you have one–I don’t so I just used scissors; I also cut from the front to stay on the lines!). Carefully put everything including the scraps into a plastic bag, carry it to your dryer, and set it on air dry for maybe 5 minutes. The fluff ends up in the lint filter, so remember to empty it out and perhaps use a damp cloth to wipe out any stray bits. This reduces the shedding by about 90 percent! Call me a Shannon Cuddle fan! A heavenly combination: my studio, my Janome 9400 and Shannon Fabrics cuddle fabric–I’m ready for winter! This fabric is so soft you just want to pet it, snuggle under it, and not give it away as a gift! Last May, Janome America had its first ever Janome Education Summit, and one of the presenters was Shannon Fabrics. From the kit they provided, I made the lovely summery top in this blogpost. But they also shared samples of their fabrics, including these two. 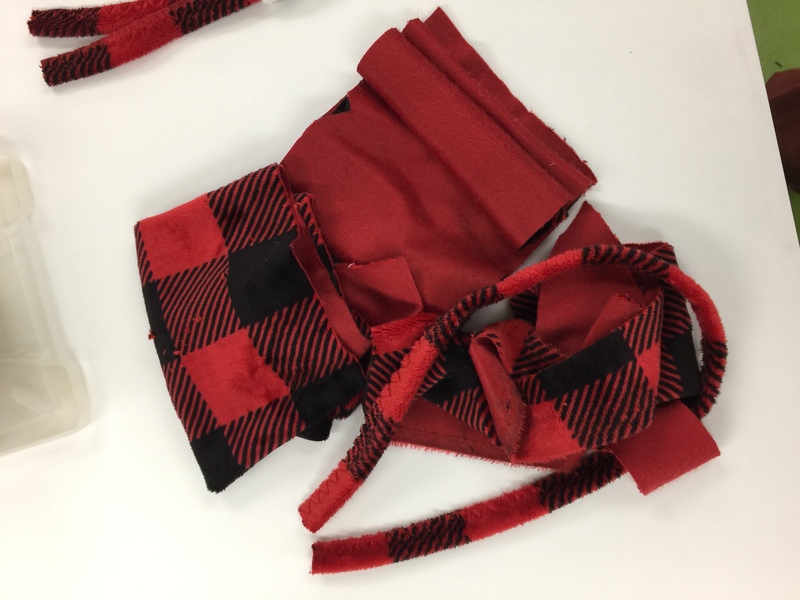 True confession: I have this Elmer Fudd-esque love affair with red and black buffalo check. 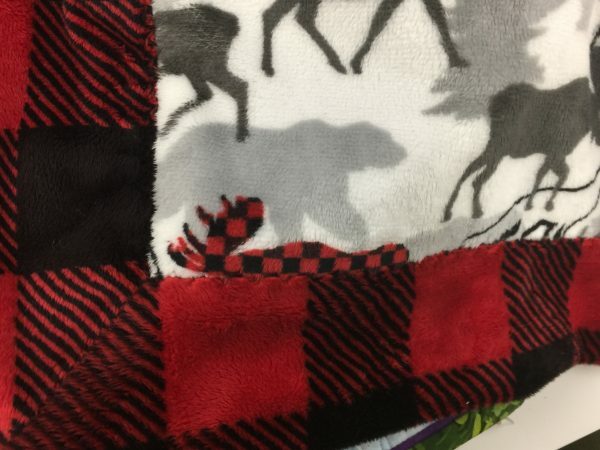 When I got home from the Janome event, I searched for the cuddle buffalo check on the internet wanting to buy multiple yards of it it but couldn’t find it anywhere, so contacted the presenter from Shannon Fabrics, who told me it wasn’t available until summer for the new fall season. I ordered some other Shannon Cuddle and Luxe Fur from Fabric.com (still waiting to make that up, stay tuned in December). Mid summer I still couldn’t find it, so I wrote to her again, and she SENT ME a big box to make not one but TWO projects. This throw is SO fast and easy and it would make an awesome holiday gift. Literally, I made it in a short afternoon! Me by the fireplace, wrapped in my jumbo throw. This is big enough for two people on a sofa. Or one person a cat and a pug in a chair. Ahem (photo below). The two fabrics pictured are available at Fabric.com here/minky buffalo check and here/Studio minky forest park, both in the scarlet color way. It is also available in a blue version, and there is a lovely silvery gray and white buffalo check too. I used two yards of each, but had a little of the print leftover–gonna make a hat out of that! You’ll also need some thread–color doesn’t really matter as it disappears into the pile, but I did use red. If I had found the Shannon free pattern and video (keep reading) I would have ordered 2 1/3 yards of the check since you need a little extra to wrap. Instead, I trimmed down my white print to work. A blogpost with lots of pictures is better. Here is the throw on the love seat / reading zone in my basement studio. You can see how large it is! 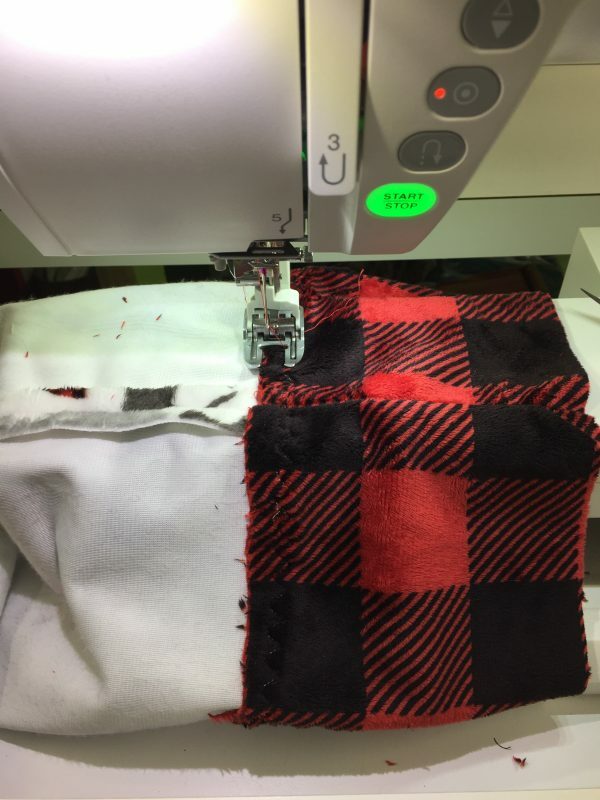 The BEST tip for minimizing lint came from Ellen of Shannon Fabrics in May: you know you when you cut Minky and similar fabrics you end up with little bits of fluff EVERYwhere forever? Not any more! First, especially with the long fur-like fabrics (in my upcoming December project), cut your fleece from the back cutting only through the knit backing. This minimizes the snipped bits of fluff. You can also do as I did with the regular pile cuddle (what I used here) and use a rotary cutter. Then scoop up ALL the pieces (including leftovers if you keep them for small projects later), perhaps into a basket or large plastic bag, and take them to your DRYER. Yes, the clothes dryer. Tumble on no-heat for about ten minutes, then CLEAN THE LINT FILTER. About 80+ percent of that fluff will end up in the lint filter and not all over your sewing space and house. OMG it really worked! There is no stretch on the lengthwise grain. At all. If you make a garment (my next project) make sure you keep grainline in mind when fitting the garment. The fabric DOES NOT RAVEL. At ALL. That means you don’t have to turn under edges!!!!!! That means these projects are FAST! Stitch length: The fleece will hide your stitches. That means it will be challenging if you decide you need to remove any of the stitches, so pin carefully to avoid ripping out! Also, it is good to use a slightly longer stitch length. I used a 3.0. Best stitch for seams on knits: For garments, using a zigzag or “lightning” zigzag will at a 1.0 width will look like a straight stitch seam from the outside, but adds a little bit of flexibility and therefore helps avoid popping stitches in the seam. Shannon Fabrics has many free patterns available. I used this one for my throw, a youTube video called Cuddle Self-Binding Blanket from Shannon and FleeceFun.com. I hadn’t found this video when I requested my fabric. 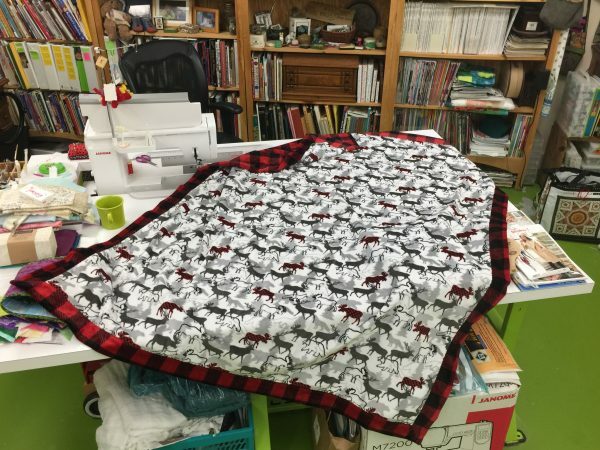 If I had, I would have ordered 2 1/3 yard of the buffalo check and 2 yards of the forest park print and had a slightly larger (better!) throw. WATCH the video before you order fabric…it is only 7 minutes long and will help you. I used a serpentine stitch on my Janome 9400, an “S” shaped stitch to sew down the edges. You could also use a blanket stitch or a 3-step zigzag (the one that takes three stitches in one direction, then three stitches the other way). I mean, you can’t even SEE the stitches. Here’s what the serpentine stitch looks like from the back. I used red thread and you can’t even SEE the red on the black square! I have been a Janome Fan-Girl for 15+years now. I am now a Shannon Fan-Girl too! 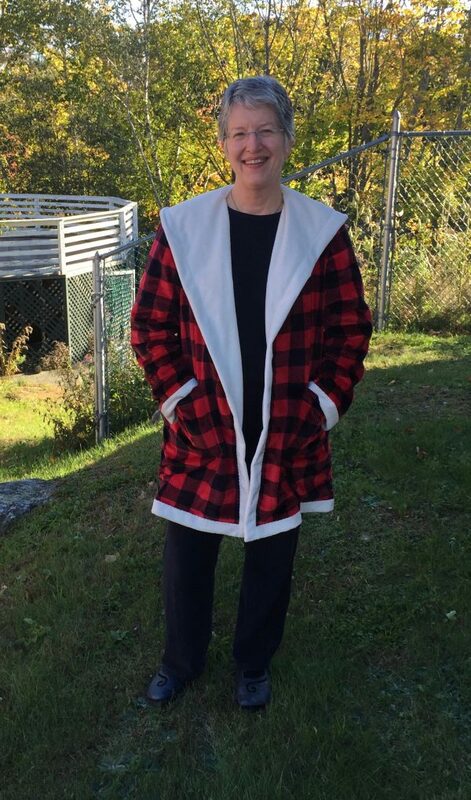 I’m finishing up a winter jacket with more of the buffalo check and a cream cuddle fleece lining, and will share something else that will be a gift for Christmas–perhaps in late November which is plenty of time for you to whip up a few of them in time for holiday giving. Or keeping. Ahem! 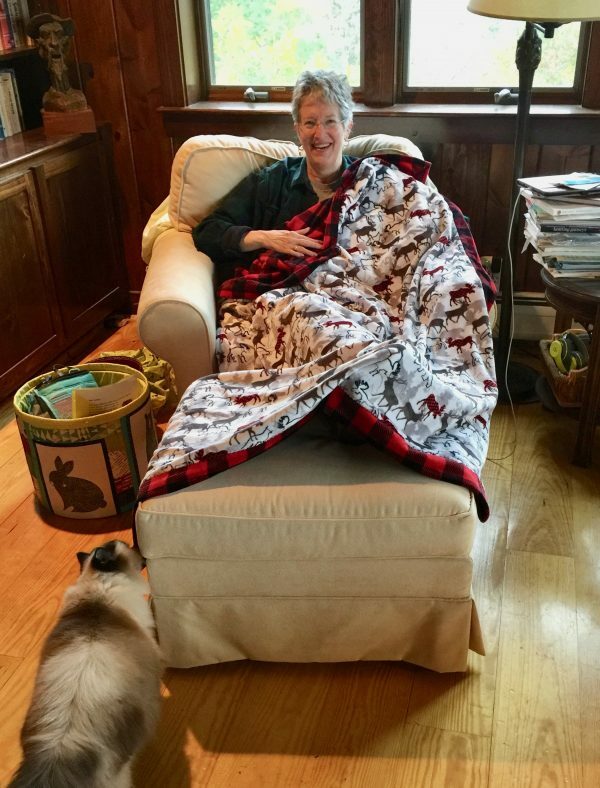 This is what I expect to look like most evenings in winter: in my chair in the living room, me and pug under the throw, cat checking things out, ready to make a dent in my pile of reading! And because it is boring, this photo is last, but it shows the throw out flat. THANK YOU SHANNON FABRICS for this fabric which I was totally prepared to order! I have purchased more of their fabrics own my own and know I will be using it again. 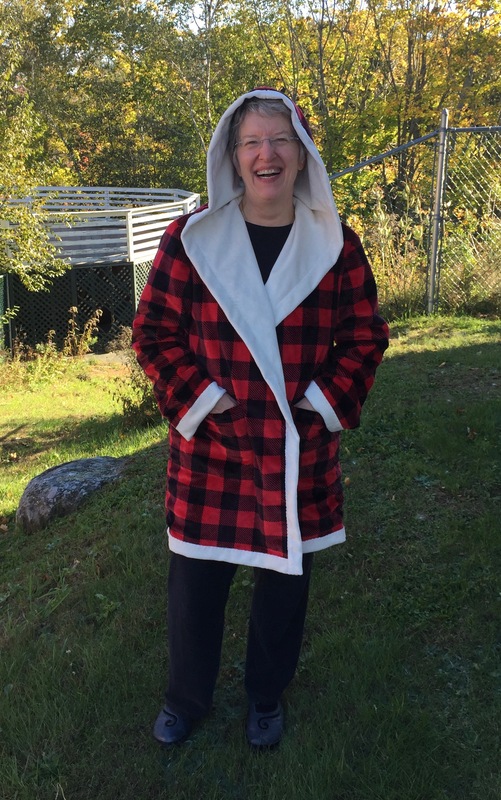 If they ever make their “Spa” line in some bold colors (not pastel, not purple) I am so gonna make a bathrobe…..in the meantime, I have more snuggle quilts and gifts to make to keep me plenty busy. And as always, Thank You Janome America for making the best machines EVER! laid out flat on my studio floor (cement painted green! )…big, warm, SOFT. And did I mention, SOFT!